Blockchain ‘banking for the bankless’ project Humaniq has opened up a London office, growing and internationalising their team of banking, finance, business and humanitarian experts in advance of their Initial Coin Offering (ICO) fundraising which launches on April 6, 2017. This adds to the company’s existing presence in Moscow and Luxembourg. The London office will be a key strategic hub for the Humaniq team. It was formed to begin the broader build-out of Humaniq across the global Fintech ecosystem and develop partnerships with startups, emerging technology experts, humanitarian organisations and the philanthropic community. The extended group, including advisors and associates, met on March 11, 2017 in a workshop to discuss strategy, marketing, structure and how best to move the company forward. Discussions including utility value for the HMQ cryptocurrency, ICO marketing, potential case studies, ‘preferential’’ investment opportunities for initial ICO backers. Plans for growth include the creation of the Humaniq Foundation to manage the open source stack and API integrations with financial inclusion startups and services out of Zug, Switzerland in Cryptovalley as well as a corporate entity in Luxembourg which will lead an incubator for startups building third party applications on top of the core Humaniq platform. 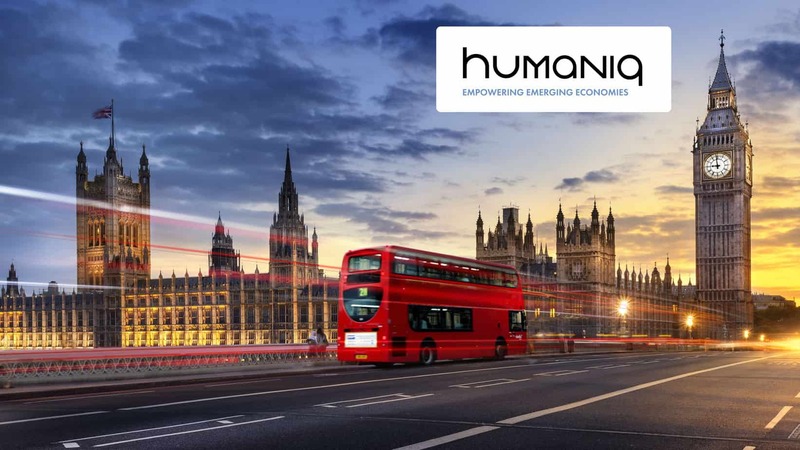 Humaniq’s London office has been created with the support of Diana Biggs, an expert in financial inclusion and blockchain technology who advises on emerging technologies, financial services and social change. She is the Industry Advisor at the UCL Centre for Blockchain Technologies, advises on technology and social enterprise for international organizations and non-profits and is a published author on the use of emerging technologies by non-banks for financial inclusion. Biggs previously served as VP of Growth and Partnerships, UK & EMEA, for digital currency platform Uphold and as Chief Strategy Officer for Soko, a Kenya-based e-commerce platform and social enterprise. She brings extensive experience building and managing large scale projects in developing markets. Chief Marketing Officer (CMO) Richard Kastelein will also be working with the London team on communications and strategy. Kastelein is the publisher and editor-in-chief of Blockchain News, partner at Blockchain Partners in NYC and has been representing Humaniq at events in London, The Hague, Bucharest, Nairobi, Tel Aviv, Manchester, Brussels, and Barcelona as well as others in upcoming months. Kastelein has served as an advisory member of multiple ICOs and Blockchain companies and sits on the steering committee of the international Blockchain Ecosystem Network (BECON). London-based Dinis Guarda is joining Humaniq in an advisory role. Guarda brings 20+ years experience in business and digital transformation. A strategist, curator, programmer and producer he has worked with major global organisations. In addition to the London team, Alexander Perkins, an associate at Deep Knowledge Ventures, joins Humaniq as Vice President covering the American market. With the goal of bringing two billion unbanked people into the global economy, Humaniq is already off to a great start after succeeding with their December 2016 initial crowdfunding campaign, and the startup has an ambitious agenda for 2017. Humaniq has already gotten off to a good start as a new company. During a short-notice December campaign, they managed to raise over $110,000 in Bitcoin and Ether during their pre-ICO initial crowdfunding, beating their target of $68,000 by a hefty margin. Humaniq was launched in 2016 by founder Alex Fork after a February 2016 interview with Ethereum founder Vitalik Buterin where they discussed the challenges of integrating charities with Blockchain technology. At an ICT conference in Moldova in April, Alex met with UN representatives to talk about who to partner with and what’s needed to help emerging economies where millions of people don’t have bank accounts and live on less than €2 euro per day. “We’ve made great progress during the last few months with our technology stack and have developed relationships with new partners for our regional expansion plans in Africa, Asia and India. The humanitarian mission of the project has attracted significant attention and even exceeded our most optimistic expectations. Interest is growing exponentially from multiple network partners and industry allies who are offering promising options for strategic partnerships and future development. With the launch of our London headquarters, in addition to taking on some serious heavyweights in the financial industry, we feel confident that we can convert potential into practice for the benefit of humanity, by being part of the solution aiming at lifting two billion people out of poverty. London is the heart of the global financial industry and a great home for Humaniq to consolidate its operations.“ said Alex Fork. Founder Alex Fork has been deeply involved in the Blockchain and fintech community for over four years. Alex is the director of FutureFinTech in Russia, which incubates and advises Fintech startups in Russia and Eastern Europe. In addition, he’s also one of the leaders of Blockchain.Community, which is a borderless community of entrepreneurs, experts, and enthusiasts whose goal is to connect people in the Blockchain community in order to drive development and adoption of Blockchain technology worldwide.